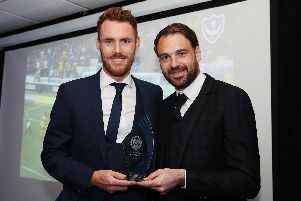 Kal Naismith has revealed Pompey was the only place for him. The former Rangers forward penned a three-year deal at Fratton Park today – with Accrington Stanley receiving an undisclosed fee from the Blues. And the 23-year-old insisted his move to Fratton Park was an easy decision after he heard of the club’s interest. Naismith said: ‘The deal came about about a week ago. ‘There was other interest but once I knew Pompey wanted me it was the only place I wanted to go. Naismith played 17 times and scored once for Rangers. He had spells on loan at Cowdenbeath and Partick Thistle before sealing a move to Accrington in 2013. The Glasgow-born forward went on to score 14 times in 73 appearances during his stay at the Crown Ground. He has now become the second summer arrival at Fratton Park – following Kyle Bennett – as new boss Paul Cook begins to shape his squad.